sweet or mild-flavored foods, mostly hot. around egg dishes and meats such as sausage and bacon. toast with jam or jelly, and fruit juice. served with bacon, ham or sausages. 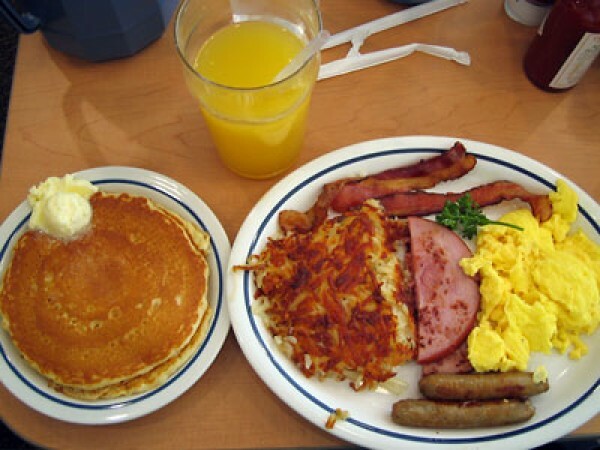 The american b'fast contain more food items compared to the English b'fast…so it means english b'fast has less food items. although both the breakfast types are very elaborate but then yes, English breakfast is much heavier comprising of around 10 courses. I'd be interested to know what English Breakfast has 10 courses. I've never had an English Breakfast with 10 courses! and I am English and live in England.